Seeing a phone with power left when you get home will give any user peace of mind just in case they left their charger or power bank on a work day. That’s what the Moto E3 Power can offer but what it can’t though are heavy gaming and stutter-free performance. Moto E3 Power is priced Rs 7999 and is it a good device to buy? Ideally no, it is not the best value for money device in this segment. But having said that it is not a bad device either, with a decent camera and good software, it is a decent performer. The sole reason to buy the Moto E3 Power is its battery life. However, we think the Xiaomi Redmi 3s is the better overall smartphone. It doesn’t have the same battery life that the Moto E does, but still lasts a full day. The Moto E3 Power doesn’t provide the experience that Motorola promises and isn’t a worthy purchase. Buy it only if you want Motorola’s brand name and can’t compromise even a minute on battery life. Ideally, it shouldn't be your first preference, but oh well, if you absolutely have to have a smartphone right now, it's worth a second look, at least. It is also easier to buy. There are a few other options. The Coolpad Note 3 Lite is one of them. If, however, you're looking to buy a Moto phone, the Moto G4 Play (even though it has a smaller battery) makes a little more sense than the Moto E3 Power. It does cost a little more though. The Moto G3 Turbo is also a good option. Model: The Motorola Moto E3 Power is a mid-range smartphone by Motorola Mobility that looks very simple and functional. It doesn’t have any kind of outstanding features in terms of design but this is not bad. It is powered by a MediaTek quad-core chipset, a Mali-T720MP2 GPU and 2 GB RAM. It comes with 16 GB of internal storage, which might not be sufficient for users who install a lot of apps or snap a lot of photos and record many videos. However, users can expand the storage capacity by up to 32 GB with a microSD card. There are two colors available to be chosen, which are black and white. The smartphone has a water repellent nano-coating which creates a water repellent barrier to help protect against moderate exposure to water such as accidental spills, splashes, or light rain. However, it is not suggested to use the phone submerged in water or exposed to pressurized water since it is not waterproof. There are many flagship smartphones which feature water and dust proofing but seeing this available on a mid-tier phone such as the E3 Power is certainly a good thing. 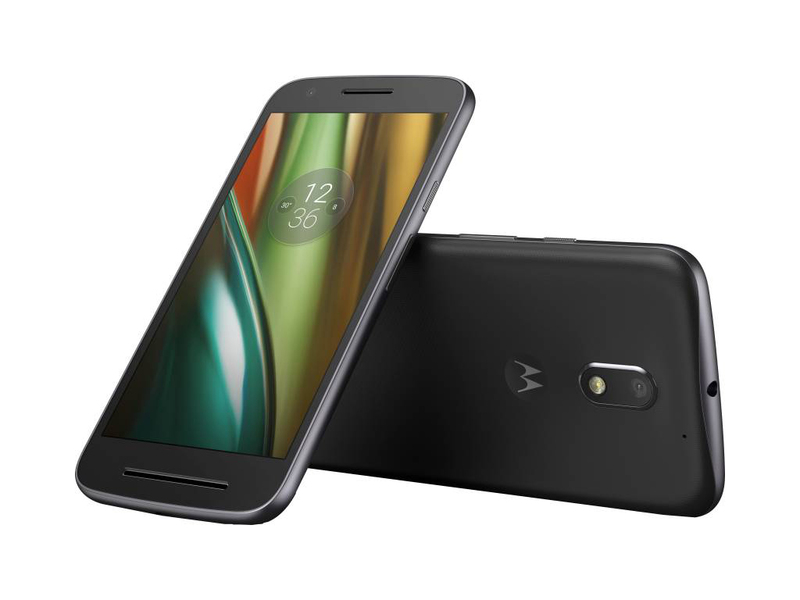 The Motorola Moto E3 Power measures at 143.8 x 71.6 x 9.6 mm (5.66 x 2.82 x 0.38 in) and weighs at 153.5 g (5.43 oz). It is powered by a removable Li-Ion 3500 mAh battery, which last a day during normal usage. It also supports fast battery charging. As for operating system, it runs on Android 6.0 Marshmallow. Motorola Mobility smartphones always run on stock Android which is bloatware-free and not modified by other vendors, something that was made possible by their previous partnerships with google. The Motorola Moto E3 Power is no exception from this, which will ensure user experiencing the original version of Android. As for the display, it features a 5.0-inch IPS LCD capacitive touchscreen supporting 16M colors with a resolution of 720 x 1280 pixels and a pixel density of 294 PPI. The screen-to-body ratio is at approximately 66.9% which almost the same as of an Apple iPhone 6 Plus. Its primary camera of 8 MP with autofocus and LED flash is capable of recording 720p videos at 30 fps, which is quite low for a device in this category. Most mid-range smartphones are capable of shooting Full HD videos. The secondary 5 MP camera with beautification mode is ideal for pretty selfies. Additional features of the camera include Burst mode, HDR , Panorama, Tap (anywhere) to capture and Tap to focus. With dual sim dual standby support, it is capable of using two micro-SIM cards simultaneously. This is useful especially for people who travel a lot, since they can use a SIM card of the country they visit without needing to remove their local SIM card. For connectivity, it has Wi-Fi 802.11 b/g/n, hotspot, Bluetooth v4.0, GPS, FM radio and supporting 2G/3G/4G network. Sensors built-in include an accelerometer and a proximity sensor. As for input/output ports, it features microUSB v2.0 and a 3.5 mm headphone jack.